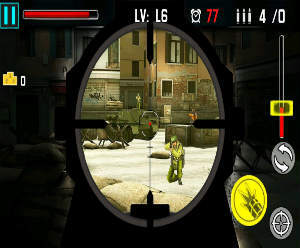 Shoot War: Gun Fire Defense is a free action game for the Android. 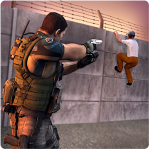 That is a casual shooting defense game on your Android, lets you try to defend the head of the beach against the enemies trying to come-in from that direction. 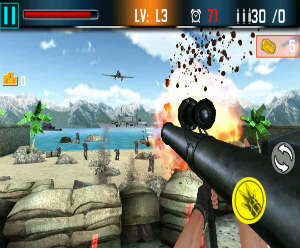 In Shoot War: Gun Fire Defense, enemies will try to assualt the beach from the sea, air and they will use not just infantry but war planes and tanks as well, then you will have to protect that beach and try to stop their advance through that direction. Shoot all who will try to ingress on your position, use various weapons available, and buy at the store what ever you might still need to accomplish your mission. 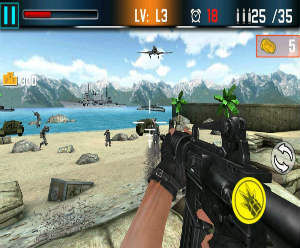 – Shoot War: Gun Fire Defense offers a variety of weapons and equipment for players to use, including: Bomb, MP7A1, Elite, AW50, AS50, AWP, Bazooka, M134, M4A1. You can click on the “switch weapons button” to switch your weapons. – Game control convenient, slide the left half of the screen to control walking, the right half of the screen to adjust the direction of the slide. 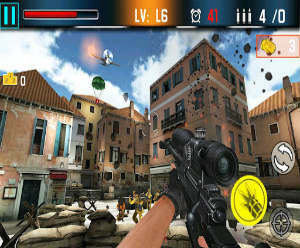 – You can get gold award in the game by kill enemies,and use the gold to buy weapons and ammunition which you want in the store. 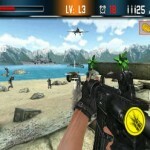 Download Shoot War: Gun Fire Defense and start playing for free today!